In these highly politically charged times, I find that people are concerned about how to participate in conversations that touch on the presidential election and other related topics. It has been generations since people have so been actively watching and talking about the United States political process, that it leaves many nervous about their business relationships. Nobody wants to offend anyone or be offended by others. We have all been counseled to avoid discussing religion and politics, but I don't know if that is necessary, or even good advice. The current race between Barak Obama and John McCain has reached historic proportions, and it is inevitable, unless you are a hermit, that you will encounter such discussions in and around your professional life. I enjoy reading, learning, studying and talking about politics, candidates and the issues that face our world. I also understand that other people have different opinions and experiences, which will make some see things differently. That is okay with me. Passion also can stir the pot. People get very passionate about their points of view. While I admire those who have that "fire in their belly" for their cause, it is NEVER an excuse for being disrespectful. Our society has forgotten this. Disrespect and rhetoric is a badge of honor to many, and I wish more people would stand up and say "Enough!" I was raised to be respectful of people from different religions, races, political beliefs and financial positions. Rich or poor, republican or democrat, catholic or jewish, Chinese or South American .... I firmly believe that all good people are to be allowed to have their political beliefs. My father taughtt me not to demonize others for their differences. I have discovered through my own experience that when we cherish others for what makes them unique, we personally become better than we were before. When engaging with others in discussions where you do not agree, simply be respectful. There is no harm in people having conversations when they are on different sides of an issue, as long as they treat each other fairly. If you find it necessary to say hurtful and aggressive words, you will both end up bruised. You will never persuade most people to convert to your opinion in a casual conversation, so let them learn to respect your beliefs by respecting your actions. I have changed my mind on a major controversial national issue. I did this because of a conversations I had with a very knowledgeable person, but one whom I thought was wrong. He listened to my point of view, and shared his. Never did he try to convert me or put me down for my stance. Instead, he asked me to explain what brought me to this decision. He accepted my place and did not outwardly judge me. I did not change my mind that day, but I like to contemplate issues when exposed to new information, and over time I softened. While I still do not see the issue 100% his way, I have changed from my previous position on this issue. Had he put me down or belittled, I probably would have dug in my heels. I wrote a few days ago about how the far right and far left have both turned me off with their attacks on the Obama / Biden ticket and the McCain / Palin ticket. The hateful personal attacks have soured me about politics on many levels. The joy that some find in trying to harm the good people on the other side is not fun to watch. Reading many blogs has left me feeling sad about the future of our country, as these hateful souls are our people. What is funny is how those who share their views chime in with "right on"...not "come on folks, lets be respectful". Viewing politics is like watching them make sausage. Icky. However, I believe that most people we encounter are in the middle and only care about seeing changes that can help all people. One cannot turn on the TV, computer, or pick up a newspaper (yes, some of us still read the newspaper) without being touched by the world of politics, thus it will be discussed.... by those who are informed and by those who are not. So you need to be ready to discuss politics. 1. Remember that the country is split on many issues. If you have a strong view, keep in mind that other people might have conflicting views. Be respectful of their position. Realize that they have an equal right to their opinion (there are some issues where this is not the case, but most issues are okay for people to disagree) and let them know that you respect their right to their point of view, albeit different from yours. 2. Do not try to change their mind. Realize that most people do not flip flop quickly on the important issues of our day. If you cannot move them in one conversation, then there is no reason to get heated. 3. Ask them questions about their views and why they believe these things. People who will openly talk about controversial issues will usually share their back story. When you remember that a person's unique background influences how they see the world, you will be more apt to respect how they chose their position. You need not agree with them, but understanding will take you a long way. Just because you have a different background does not mean you can't respect theirs. 4. Never put down the politicians that the other person supports. Attacking a person's chosen candidate is often taken as a personal attack. While you might not agree with the choice, in our country people are allowed to vote for their candidate they choose without you making them feel bad. 5. Try to learn. If you think that you are smarter than everyone else you might just be a fool. I have found that people whom I disagree with are some of the best teachers. I learn more from those with whom I am different than I do from those who are just like me. Not better or worse, just different. This does not mean I will change my mind to accept their view, but how they reached their decisions and how they conduct themselves as a person can be in itself and education. 6. Never have a conversation with someone who cannot be respectful back to you. If they say hurtful disrespectful things. walk away. In the end when someone is a jerk toward you are others, you cannot fix them. Jumping into the mud with them will just leave you feeling dirty. When we approach each other as valuable individuals, then we can have civil conversations that will benefit everyone. I think John McCain and Barak Obama both want to see this race remain out of the gutter. Win or Lose, both sides can be respectful of each other and put America first. Barak Obama, John McCain, Joe Biden and Sarah Palin are all good people who want to serve. If we see them this way, then we can have a better way. Can it happen? That is up to you and me. I wrote the below article for the Bulldog Sollutions Marketing Watchdog Journal. Beyond Business Cards and Boardrooms! Business professionals often wonder if their networking efforts are really the worth time and money invested. They look to the hours they invest in attending corporate events, talking to people, following up with key individuals and cultivating all their relationships via their online social media tools—and then see an exorbitant amount of time necessary to create exceptional relationships with others in their business community. But beware: If you only focus on short-term payoff, networking may not seem to have the ROI "bang" that you dream about. The fact is, networking goes beyond just meeting people and trading business cards. Most business professionals instinctively know that people do business with those they know, like and trust—yet they are not confident that they can build the types of bonds that will lead to more business in the limited amount of time they have available. Thus many reject the whole concept of networking and fail to make it a priority in their overall corporate marketing structure. Additionally many business networking activities take a commitment of dollars and time, both of which are limited for entrepreneurs and corporate managers. They see the number of items already on their to-do list and rationalize that networking is just fluff. Is it really worth it to make a priority of building a network of professionals? In order to understand the power of business relationships and networking, one first must admit that all opportunities come from people. It makes no difference what you have going for you in your life or business, the original opportunity existed because of a person. A person introduced you to your husband or wife, a person hired you for your dream job, and all of your clients and prospects are human beings. Nobody succeeds in a vacuum—and your doorknob cannot suggest an idea that takes your company to the next levels (unless you are a doorknob retail outlet). It's a Give and Take. Mostly Give. Beyond just admitting that people are important, you must also make them a priority. Too often people assume that those they meet networking will run back to their office and immediately begin making key introductions. They fantasize about how their new friends will bring opportunities and leads that will benefit them in their careers. They go home and wait. When the phone never rings, they sour on the whole idea. What a true networker should do is go back to the office and look for ways to facilitate important introductions for others. If you want other people to work with your best interests at heart, you must work for them first. Are You the "Go-To" Guru? Simply having the right connections, networking can also expose you and your company to early industry trends. When you are well connected, people will turn to you with ideas and information. Recognizing how to harness the information is key. You will learn what your competitors are doing, and this will help you better plan strategically. People will also seek out your advice, and you will be seen as the "go-to" in your community for all things surrounding your industry. The well-connected individual is often the sage. San Diego State University marketing professor William Baker has conducted research on the benefits of networking. While it is hard to quantify, he found that those who network do realize more success. In an interview with Business Week columnist Karen Klein, he stated that networking has "a strong main effect on performance measures relating to innovation, most notably the ability of firms to develop new products." In other words, if your team is hiding in the office and not interacting with outsiders, they will likely miss an opportunity to apply a fresh, innovative perspective on products and services that could establish your company as the cutting-edge leader. Creating a networking culture in your organization that extends across a variety of industries will make your company more successful. Being known to others is worth the time investment. Using a variety of online and in-person venues to cultivate relationships with people is one of the smartest things that you can do to position your company. And when you support your employees' networking efforts, you create an atmosphere that lends itself to success: information, innovation, ideas and inspiration. This is not about becoming the new "Paris Hilton" of your industry, but instead about combining visibility and credibility. You need both. Make sure that people inside and outside your organization understand your company, its products and its vision. Embrace the power of business relationships to help lead your business to greater success. When you appreciate someone .... tell them. Last night I had the honor and privilege of serving as the Master of Ceremonies for the 8th Annual Austin Business Awards. Twenty-four companies and not-for-profit organizations were honored in six categories for their unique contributions to making Austin one of the most amazing places to live and work. One audience member, whom I had never met, came up to me after the event and told me I did a great job. He had walked across the room with the soul purpose of telling me he enjoyed the evening! He had a genuine smile, and his words made my day. Speaking is part of what I do for my career, but having people seek you out and tell you they appreciate your efforts, even when it is routine.... embraces your soul. I was reminded by this man's gesture that I too should seek out those who impact my world and tell them they are doing a great job... even if it is just part of their daily grind. We are all touched by those who make our lives easier, or just make us smile. From the bartista at Starbucks, to your co-workers, to your family --- we all should reach out our hand and say "Great Job!" The people on the other end of your complement will be transformed by your words. Try this today. Praise others and pay the joy of life forward. Regardless of what industry you work in or the job title you hold, you are always sending messages to the business community. I am not talking about blogging, texting, brochures, cold-calling, public relations, advertising, emails, giving speeches, sign language or other planned communications. Instead I am referring to your actions. The old cliche "your actions speak so loud I cannot hear what you are saying" is true. We all have good intentions and a public message that we profess, but it is what we do that really is noticed by others. Nobody is perfect all the time, but over a lifetime our actions prove our souls. A mistake on occasion is forgiven, but a pattern cannot be ignored. We all have friends with whom we share history, but who are either selfish or they are flakes. We come to expect them to let us down. They don't mean to cancel lunch at the last minute EVERY TIME, or in some other manner disappoint, but they do it time after time. Eventually we just know that they are not reliable or we dump them. We either accept them with their faults or we move on. The same is true in professional relationships. Others are watching your every move and developing opinions about you. They are telling your customers, prospects, referral sources and others about the positive and negative aspects of your reputation. I have talked to many who think it is "unfair" that people are always watching and judging. But like I tell my 11 year old, "who said life is fair?" I know that there are people in my business community who are critical of me. Sometimes I deserve their sideways opinions (I am just a person with faults)....other times they are taking small things they witness (or think they witness) and developing a point of view on the whole package. In the end, I try not to worry about those who are negative, and I go on about my actions trying to do the best I can. The thing is that no person is just what you see. Steve Harper had a great blog post about "the back story" a few weeks ago that reminded me to remember that everyone has a part of them that is not visible publicly. We cannot know why a person makes the decisions they make or takes certain actions. Thus, it is best to be slower to judge! Yet regardless of how fast or slow people judge you, they do. The best antidote to this is to think about how your actions might effect others. Make certain that your commitments are fulfilled consistently, and that you are not rationalizing bad behavior assuming others will understand. Every choice you make leads you closer to your ultimate goal or leads you astray. This applies to the big actions and the small actions. Remember that and it makes all your choices much simpler. Only a few days left to vote for your favorite panel suggestions for the 2009 SXSW Interactive Conference. I would appreciate you looking at my panel suggestions (CLICK HERE). If you like what you see, vote for me and / or leave a comment. It would mean a lot to me if you could vote and comment. If you are a regular reader, just take a moment and help out. Update 2012 - Over the last four years this post has received many many hits from Google searches about the short list for VP candidates. On this blog I sort-of predicted both candidates selections. History has shown that Ms Palin was not qualified or ready for the spot. Many have made her out to be some awful person..... but so much was made of her on both sides that she has become an icon. Love her or hate her... she was an interesting selection. And in the end, McCain was going to lose anyway. I have stayed out of politics since the 2008 elections. I used to love the whole process.... but too many people get too ugly about it. Both parties have ugly twin souls in how nasty they get, and I no longer feel comfortable with the process. If you have come to this blog on a search..... enjoy reading my analysis. But this does not really define anything about me or anything else. Update August 29th - 9:45 AM-- The News Media is reporting that John McCain has selected Sarah Palin, the Governor of Alaska, as the Vice Presidential nominee for the Republican Party. WOW. While still undecided about this race, I wanted to see McCain prove his "maverick" image and go with a BOLD choice. I think this is a very interesting and exciting choice. As the father of two daughters I am thrilled to see him select a woman. Both parties have done amazing things in this election to buck the "same old, same old" - and I am proud of Mrs. Clinton, Mr. Obama and Mrs. Palin for their roles in knocking down walls. I think the future looks very bright with the way both political parties have gone with regards to race and gender. Rock on. Now will come the really ugly stuff. I already got a twitter message from an Obama supporter who questioned Mrs. Palin's level of experience. I thought that Bill Clinton said the other day that it was not years on the job that mattered. Now I guess it does to some. I am confused. Maybe those who are left think experience (or limited experience) matters for Palin.... and those on the right think experience (or limited experience) matters for Obama. I warn all of both parties to be careful about double standards, they make you look cheesy. I think this election period just got a jolt of spice. I think if it can stay out of the gutter, the next couple of months will prove to be the most exciting times of all our lives... no matter who wins. I encourage everyone to relish having a seat to history as we have the most historic presidential election of our time. I ask those who are hatred filled party extremists in both camps to shut the hell up and let the amazing nature of this whole thing shine. Come on.... no matter who you supported when you woke up this morning, this announcement has to make you says "WOW". Update 8/29/08 - 5:30 AM. Today McCain will make his announcement. The press seems to think he is going with a "traditional" choice. That would make me yawn. As an undecided voter, I would be more interested in McCain if he had a "maverick" choice. My gut tells me that he is going to go BIG. My brain says Romney. I am going to hold out that he picks a woman. I have done a lot of reading about Sarah Palin and Kay Bailey Hutchison...and both are strong choices for his vice president. Meg Whitman (former CEO of EBay) and Carly Fiorina (former CEO of HP) are two additional names that have been floated around as "dark horse" picks. Come on John, be a maverick. Make us take notice. It is rumored that all of his short list are on their way to Dayton, Ohio for the announcement. Maybe he will have all of them on stage and open an envelope "And the winner is...."
I do think having everyone on stage at once would be a great event. It would show that all of these fine candidates are on board and support the ticket. This would get a lot of attention, and maybe take the focus off last nights great speech by Barak Obama. If nothing else, having your whole short list appear together would be unique and worthy of the attention it would garner. (however, people will complain it was grandstanding...as these political times make people just pick sides. If John McCain cured cancer there would be democrats who would be pissed off about it! --- ditto goes for Barak Obama .... the republicans would have the same issue). Over the weekend Barak Obama selected Senator Joseph Biden as his running mate. I had predicted the choice here, and analyzed his choices on filling the number two spot. While I am not a political expert, I have loved presidential politics since my early childhood memory of Nixon's resignation (I was 6). Now the Democrats will converge on Denver for the convention. I love watching the conventions on television. As a professional speaker, these event are like "Speaker's University". Many who will take the podium during prime time will deliver wonderful prose, while others will just fall flat in connecting with the audience. Using this as a study in presentation skills is always my favorite part every four years. As soon as the excitement in Denver dies down, it will be John McCain and the Republican's show in St. Paul. I will watch both conventions with the same gusto (my wife hates this, as watching politicians speak on TV for two weeks is just one step above a root canal). I am enjoying my status as an "undecided voter" (something I have never really been before). While I think Biden was the best choice for Obama to win the White House, it was also a "safe" and "political" choice. He is not a beacon for "change in Washington", but he does help the ticket. The best line I heard somewhere this weekend was "If Obama was looking for change, who knew change had been hiding in the US Senate for over 30 years". But Obama is not going to be focused on change for the next three months, he is going to be focused on winning the election. All other bets are off until November (that is not a jab at Obama, McCain has the same goal and will do all the same yucky political backstabbing stuff that the you will see from both parties. Anyone who thinks their side is somehow above the dirty stuff is blinded by their own ideology! I get really sick of those on the right and the left who point fingers at the other side. Both major parties are equal co-conspirators in the ugliness of our politics). The choice of Biden gives McCain a bit of a gift. Joe Biden is a good choice, but not one that stirs the hearts, minds and imaginations of the electorate. It leaves an opening for Washington insider and old white man John McCain to once again prove that he is a maverick. It is why people have liked McCain for decades. He does thing his own way and bucks his party's line when he wants to. If this mean breaking with the Republican party traditional views and party leaders... he does it. If we remember 2004, there were those in the Democratic Party who thought McCain would make a good running mate for John Kerry. He was not asked, but the idea was certainly floated out there. McCain's history of crossing the isle on many issues is what those in the center like about the guy. Kerry might have been better served by McCain than John Edwards, as it turns out. So if the Republican nominee picks a political insider who is an old white guy he misses the opportunity to put some pizazz into his campaign. Much like the selection of Biden brings balance to the young, charismatic, and lovable new comer, Obama..... McCain needs to find someone who creates balance to his image. A running mate that makes people stand up and say "WOW, bold choice!" The "Short List" for John McCain is not really that short. The press and others keep adding names. Here are some, but not all the choices that I have heard in recent days: Tom Ridge, Mitt Romney, Joe Lieberman, Bobby Jindal, Sarah Palin, Colin Powel, Condi Rice, Mike Huckabee, Tim Pawlenty and Kay Bailey Hutchison. Tom Ridge and Mitt Romney seem to be the media favorites. Tom Ridge is a good man, but brings little to the ticket beyond delivering Pennsylvania (although that is important). Romney has experience and the look (quick, call central casting and get us a president), but too many people are jerks and get all quirky that he is a Mormon. That should not be an issue, but it is not the diversity that McCain is looking for to have a "historic" choice (nobody cares that Biden is Catholic, so the Mormon thing is not really the bold move here). Both of these two seem to be the current front-runners, but I think either is a boring choice. Good men, well qualified, but not where I would advise McCain to go with this one. Ridge is pro-choice and Romeny has flipped-flopped on that issue. Either way I think the republicans need to get away from making abortion the center piece of their platform. I am not saying they should not care about it, but having it as a litmus test alienates many who would support them on many other issues. The republicans need to be a "big tent party". But McCain sees having a pro-choice running mate as proof of his "maverick" image. I agree, but it is not big enough. It only tells the far-right, who are already suspicious of him, that he is a maverick. That message needs to play wider. Bobby Jindal, the governor of Louisiana, is an interesting choice. But he is too young. I like that his parents were from India, as as first generation American he has a great prospective. But the VP should be more than 50% the age of the Pres. It just looks like he is hanging out with someone younger than his own kids. Sara Palin, the governor of Alaska, is one of my favorite choices. I don't think she will be selected, but it would be a great move. She is 44 years old and the mother of five children. While Alaska is not a state that would be considered a "battleground race", the fact that she is from such a random state would make people pay attention to her. Come on, everyone thinks Alaska is cool. Nobody has ever been there...but we all think it is neat. Her readiness to step into the presidency would need to be discussed (I don't know enough about her... and she has only been Governor for a couple of years).... but the Idaho native who grew up in Alaska would certainly stir up the pot. She is pro-life (and one of her children has downs syndrome), but much like those on the right should not use this topic as the only factor, the same goes for the left. I think women who could get past this one topic would be impressed with Mrs. Palin. It might get some of the Hillary supporters who were focused on a woman candidate (another silly criteria... but this is life) to at least look across the isle at the Republican ticket. Kay Bailey Huchison, the senior senator from Texas would be an amazing choice if she was not from Texas. She is experienced, tough, smart and one of the highest ranking Republican women. But her Texas roots will mean that the other side will hog-tie her to George Bush. McCain is not Bush (although, that seems to be the mantra lately), but he would be smart to stay away from being liked to him. Mrs. Huchison also has made her intentions to run for governor public, and that is the office she has always desired. Update 8/28/08 -Since I wrote this blog post 5 days ago, Mrs. Huchison's name has suddenly popped to the top of the speculation lists (one friend asked me how I knew she would emerge as a front runner. I didn't, but she would be an impressive choice). None of those in the media seem to discredit her as a choice by the nature of her being a Texan. Maybe I spoke too soon and she will be selected. She would be a great choice, and it would the a "maverick" choice...which is what the Republican ticket needs for this race! Condoleezza Rice. Wow, I think she is one impressive person. But the current Secretary of State from the Bush Administration is not a good choice if McCain wants to win. I find it funny that people who do not agree with her politics try to discredit Ms. Rice as a person. She rocks. But she has never been elected to anything, and is not really the right one this time. Her involvement in the current administration would be an anchor around McCain's campaign. Tim Pawlenty, governor of Minnesota. I know nothing about him. Never heard of him. Maybe I am just out of the loop, but if others don't know him, he misses the mark of being a "splash" of a choice. The Republicans need to get some mileage out of their VP pick, not host a coming out party for some future candidate. Colin Powel. His name has come up as a possible VP choice for both parties for the last several elections. If he would do it, he is the winner. The American people love this guy, and he too is a maverick in some respects. Sure he was in the Bush Administration, but he left four years ago...and nobody knows exactly why. It is assumed the left because he disagreed with Bush's policies. That is a plus to most voters, so he is probably free from being liked to Bush. He is an honorable man and one we all would want to serve in the top offices. But he has seemed to avoid the run in the past, yet if he would take it, McCain should make the ask! The world is still a scary place and McCain and Powell have a great understanding of the dark side of international politics. Some people will freak out on two former military officers on the ticket, but there are a lot of positives that come from the experience of serving in the military. In the end, they could not be questioned on experience, and this could help lead to victory. The down side is he is 71 years old, and so you would have two old guys. But I bet people would be excited by this ticket. Joe Lieberman. I love the idea of the first guy to run of VP from both parties in just a few years. He is the Democrat's version of the McCain maverick. He crossed party lines when he had a belief, not just falling into step. The fact that he and McCain both did this in their senate careers is appealing. I want my politicians to vote their mind, not their party leaders minds. Lieberman got tossed aside for it by his party, but won re-election as an independent (seems the people of Connecticut don't listen to the party leaders either and do their own thing). I did see one friend, who is a big Obama fund raiser, write on his blog this week that he thought Lieberman was a "Judas" even back in 2000. My guess is that my friend was a huge supporter of the Gore / Lieberman ticket at that time and never once questioned the sainthood of the Connecticut senator during the Florida election debacle. But alas, now that he could be the Republican nominee for VP (and is publicly supporting McCain), many on the left feel the need to discredit him. I hate the side of this that makes passionate feelings cause good people to stop being respectful of our elected officials. In the end, I am sure most of our leaders are decent people who want to do good. I really do believe this. I don't think they are "Judas" or any other of the nasty names that those on the right and left toss about to make their case! Picking Lieberman would make the whole election season a lot of fun. I can't see the far right of the Republican party having the stomach for Lieberman, but he and McCain are good friends and have a history of working together. It would cement the maverick thing. And since most Americans claim to be solidly in the "center"...having the two most "centered - cross party line" senators from both parties on one ticket could make for that big "splash". The downside is that he, too, is old, and two old white guys, even one being Jewish, is a tough image for the GOP to get past. My prediction - John McCain will select Tom Ridge or Mitt Romney. My suggestion (yes, I am sure that John and Cindy McCain read the Some Assembly Required Blog daily. In fact, if elected, he will name me to the cabinet as Secretary of Networking...okay, maybe not). - Pick Colin Powell. If he says no, go with Joe Lieberman. If that wont fly, select Sarah Palin. Be a MAVERICK. Select someone who would make a huge impression on everyone. Show you are not worried about having a big celebrity for VP. (I hear Paris Hilton is available). From marketing this campaign the Republicans need someone who is more than Joe Biden. Not just another Joe Biden, or an unknown nobody. The McCain team needs to be bold and step out of the box. Obama has the "historic" campaign sewn up. The best they can do create their own history. They need to make the moderates take notice. The victory comes from attracting moderates!!! Guess we will know in a few days. It will be interesting to see what he does. Saturday night was the 2nd Annual Heart House Charity Fashion Show, Angels on the Runway, at the Austin Music Hall. While the final numbers are not yet available, money was pledged to support the Heart House programs through the silent and live auctions. The evening featured designs from Joanna Ruley-Garza, Robert Comstock, Stephanie Jimenez and Stephanie Montes. Additionally the models were accessorized with jewelry by Katie Wallace, and shoes by Mad About Shoes. Heart House is an amazing program that creates innovative afterschool programs for children living in neighborhoods known for high crime, high unemployment, and lack of affordable, quality care for children. Children have year round access to to a fun, experiential learning, and show significant social and academic development once enrolled in this model youth development program. I have recently joined the board of Heart House and look forward to working with their team to see continued success. Heart House is launching its new ambassadors program, The Heart House Halos. If you live and work in Austin, Texas - and would like to find a way to lend service to the community, consider becoming part of this unique organization. The Halos are a group of passionate supporters of Heart House. Each member agrees to donate or raise $1000 annually for the children of Heart House and recruit two more friends to become actively involved in the Halos. Heart House impacts the lives of children and provides these kids with exposure to the joys of learning. The Halos will exist to provide hope to the future. Being part of the Halos is a great networking opportunity and the chance to help launch a social / service organization that can have a direct impact on the lives of at-risk children in Austin. If you are interested in becoming part of the inaugural Class of 2008, contact Megan Heredia at (512)929-8187. To make a donation to Heart House, CLICK HERE. Update - 8/23/08 -I am not right all the time (just ask my wife!)... but I got this one. I will take my guess at John McCain's picks on Monday. And yes, I realize that it did not take a rocket scientist to make this guess. But in politics, it is fun to speculate. More fun when you get it right. Having fun with this election circus is the only way to go. CNN is reporting this afternoon that the democratic presidential nominee, Barak Obama, has selected the person for the number two spot on the ticket. But he is not saying with whom he will be spending the next three months (and maybe then next 4-8 years). Apparently the news will be made public in the next two days. I thought I would make some predictions. I am an undecided voter (it is fun to not be behind either candidate at this point, as it makes everything they say interesting). Since I have not figured out whom would make the best leader of the free world, their VP choices are important to me. If Mr. Obama chooses Hillary Clinton it is proof that his recent slippage in the polls has his party chiefs worried. A selection of Mrs. Clinton would not be in President Obama's best interest because he needs to be THE leader. Having Bill and Hillary living next door will make him appear like the kid brother who accidentally ended up with the keys to the castle. If he wins, he will forever be over-shadowed by his VP and her husband. If he selects Joe Biden, he is smart (I think this is the best choice). Biden is a fighter. He has good experience where Obama might fall short in the opinions of some. He is also grumpy and not lovable.... but Obama is not in need of a lovable VP. He is the lovable one. Biden brings balance to the ticket and will go out and fight like hell to win. If Obama is worried about his own slip in the polls, Al Gore would be a smart choice. People now love him (they did not 8 years ago, but they do now), and he is an experienced 2nd banana....always the bridesmaid and never the bride... thus he knows his place as VP. It would certainly get a lot of attention in the press, and leave McCain without much of a chance of making a VP splash. The rest of the short list is not going to make a difference. Evan Bayh is boring. Snore. Tim Kaine is too young, and makes the contrast to McCain's claim of experience even stronger. Sam Nunn is an interesting choice, but I doubt he will go that direction. The choice of Bill Richardson could be a strong one, but we have not heard much from him since the Clintons got mad that he endorsed Obama in the primaries. My guess.....Obama selects Joe Biden. Let's see on Saturday if I am right. As for John McCain.... we have a week until he will announce. He has the advantage of watching how Obama picks. This probably has an influence. If Obama goes with Biden, then McCain has an opportunity to make a historic choice that will level some of the ground on Obama's historic candidacy. If McCain picks another old white guy I can see the Saturday Night Live cast having a field day with slogans like: "The GOP, bringing you old white men for 160 years". Will he pick a woman, a minority or Joe Lieberman? Hmmmm... I think I will try my hand at guessing his pick next week. First I want to see if my Obama logic holds up from now until Saturday. PS- The Obama team had better make sure whomever is the VP only owns one house and that the value of that property is less than $400,000. If Biden has money they had better change their pick. Ummmm, I think the whole thing about how many houses a wealthy family owns is sort of a dumb thing to go after in a campaign. It sets up all your colleagues. John Kerry is currently calling Teresa's accountant to find out how many homes she owns, cuz he knows that question will come up on Meet The Press. There are lots of wealthy democrats who will be speaking stage at the convention who are praying to God that no news network pops up the statistics of their wealth under their name. "Hillary Clinton. Senator from New York (D). One house in NY and one townhouse in Georgetown. Two book deals. One filandering husband". Not what anyone wants being discussed. I think these politicians need to get back to congress and determine the number of pieces a property a politician should own so that this is not an issue in the future campaigns. What do you think? Three homes? Maybe plus two condos, one apartment building, three strip malls and one McDonald's franchise. More than that and they should not be allowed to run for public office. I read a post on Penelope Trunk's Brazen Careerist Blog that made me vomit. Almost literally. I have become sick of the self appointed leaders of Generation Y acting like they live under a new set of rules. Life is still life. Ask all those who invested in Tech Stocks in the year 2000 who claimed that the economic model had changed for public companies. Ooops, the more things change, the more they stay the same! This nutty blog post was written by a some dude who apparently is a Generation Y celebrity (I had not heard of him, but he had heard of himself!). The title was "Seven Reasons Why My Generation Is More Productive Than Yours", and he went on to point out why today's twenty-somethings are better human beings than anyone born before 1979. Apparently there has been an evolutionary shift leaving those of us born earlier in a state of inferiority. Sorry, I never got that memo. At first I thought that the post was written as a April Fools Day joke, then I realize the author believed his mommy too much when she told him he was wonderful. His observations were a tapestry of his own youthful point of view, and were written as if some PhD at Stanford had conducted decades of research on his pontifications. It was insulting. Not just insulting to people over thirty, insulting to anyone with who lives the reality of life. I was going to site his name, and link to the post, and encourage you all to read it (so you would understand what kind of generational divisive dribble people lap up on the internet)...but that would be rewarding him for bad behavior. I hope you don't read it. Save yourself. But my faith in the future of humanity is not ruined. On Monday I had lunch with three Generation Y people who are not sniveling self-obsessed morons. My lunch companions were ambitious, gracious, and enthusiastic business professionals who are working hard to create real experiences that will lead them to achievement both personally and professionally over their lifetimes. Never once did they seem need to prove to anyone (or to themselves) that they were part of some superior generation. Instead they showed by their conversation that they are motivated individuals who are focused on creating futures. They completed lunch and did not feel entitled to having the owner of the restaurant to bring them a trophy. They do not view the different generations as part of some cosmic competition, but instead they looked at establishing a network of contacts in the business world with people of all ages and levels of experience. Creating mutually beneficial connections that lead everyone toward success is their aim. The contrast between my lunch companions and the punky post on Penelope's blog are night and day. My guess is that those who will achieve real success in their lives from this generation are not those who relish in their "twenty-ness" -- but instead those who take stock in themselves and produce results. Whiny people are always the same, regardless of their date of birth. I am here to tell you that being "twenty-something" ends. You cannot stop it (although I have read about many social media industry executives who will not reveal their real ages, as they fear being seen as obsolete by their followers if their "thirty-ness" was known.... OH PLEASE!). The problem with baiting young against old is that time marches on. The BabyBoomers who proclaimed "Don't Trust Anyone Over 30" now have to look in the mirror at their 50 and 60 year old selves. For some it is not a pretty sight. Age happens. I say "bring it on", as I understand and like myself better the older I become. I am finding that wisdom and experience are not things you can claim, but instead something you must earn. This is the most self serving piece of bulls**t I have read on any blog in a good long time. Are you really better than me? Really, do you believe this in your heart and soul? Did your mommy tell you how wonderful you are today. PLEASE. Please. please. Realize every younger generations thinks they are more cleaver than the earlier ones. In the 60s they knew their music was better. They said "don't trust anyone over 30". Your self love is not real, it is a product of being young. I am so sick and tired of these types of generational argument posts. You know what the facts are. I mean real facts, not how you feel…. Every generation has good people. And schmucks. Sure, technology changes, and those who are exposed to it when young adopt it faster and have an easier go with it. But it does not make the "old school guy" bad or yesterday's news. I think that everyone who reads crap like this post should stand up and cry "STOP" and not put up with it any more. Don't encourage those who want to set generations apart. Tell the people who write baiting and insulting (and just wrong) stuff to STOP it. We should avoid them. But instead we flock to these contrarians and shower them with attention. It is like Britney Spears and Paris Hilton. Why must we enjoy them so damn much? And it goes on and on and on. The good news is that I do not believe you can lump a whole generation together. There are just too many people in the world with too many ideas. It would be like saying "all republicans" or "all democrats" -- it is just not that easy. Instead, most of the younger business professionals that I meet are just cool folks trying to find their way in the world. Few have these huge chips on their shoulders like the writer of the above mentioned blog post. Most are just like other people who have come through their twenties in decades past. I admire their enthusiasm and dreams. Our future is in good hands, because those who give Gen Y a bad name will need to grow up, or they will be the ones who become obsolete. Those who are so focused on "being Gen Y" cannot compete with the cream of their generation who are focused on success. The three folks I had lunch with on Monday are a perfect example of the best that Gen Y has to offer! So many business professionals want to be better connected to their business community. They look at the leaders who are well known, respected and successful and envy how they are always top of mind when referrals are tossed about, speaking engagements are coordinated and industry awards are presented. I think that many people think that networking is some God-given talent or innate presentation of luck. They believe that creating and cultivating powerful business relationships is either hard or rigged. It is not hard and it is not rigged. Building an network of contacts who can (and will!!!) refer you opportunities is within the grasp of all professionals who desire to see themselves and others succeed. The best way to start is to want to see others succeed. Sure, you want to rake in the money, prestige and honors...but begin with taking joy in seeing others thrive. If you are naturally jealous of the success that others enjoy.... get over it. No matter what you do, unless you are Michael Phelps, someone else will beat you from time to time. (even Michael Phelps will see his records broken someday - think Mark Spitz who has sat out the Olympics watching his decades of gold metal records tumble like a card house). If your core reaction to others victories is positive, you are well on your way to winning networking gold. Jealousy will not even bring in the bronze. Help others reach their dreams and they (and others who witness your efforts) will want to assist you in achieving your goals. When starting to network, ask a lot of questions about what others desire to accomplish. If you do not know what they need, then you will never know how to help them. Then connect the dots. Introduce people in your network to each other when you see mutually beneficial relationships. Do not make random introductions just for the sake of making connections, save your networking capital for when you see powerful reasons that people should meet. This will help establish your reputation as someone who has networking cache. When you meet new people, do not sell them on your product or services. Instead learn about them. If you jump into sales mode too fast, you will be seen as the "Pork Chop Man". The "Pork Chop Man" is a guy who acts like a hungry wolf and devours those whom he thinks are pork chops. If you have not pork to give him, he ignores you like you are poison. Anyone can network, when they realize that networking involves more giving than getting. The good news, the getting does come for those who give. Patience is the key. I have been thinking about how we grow up. Not physically, but more in the scope of our abilities, ambitions, and our individuality. While many of us think we stop growing when we reach our twenties, and finish our education, I believe that we are always expanding. Gosh, I hope I am expanding (and not my belt size), for is we are not growing, we are dying. My eleven-year-old was off on an adventure last week. I put her on an airplane to fly alone to visit some friends and some family in Northern California. Before she departed I was talking to her about the things she needed to be aware of traveling alone and as a house guest. At one point she said "Enough Dad. If I was not ready, you would never have allowed me to go in the first place". She was right. We gave her this trip as a reward for completing her four year martial arts training. Any kid who could accomplish earning a black belt can fly alone on Southwest Airlines. Plus, the airlines do a good job of monitoring the kids under 12 (apparently over 12 they are left on their own, not sure I like that policy.... she may not be going anywhere else for a while), so she was never really "alone". While she was in California I spoke to her Godfather and later her uncle, whose families she was visiting, but never directly with her. Seems she was always too busy when I called. I knew this was her way of exploring her independence, so I did not press the issue of making her come to the phone. She was showing her mother and me that she was growing up. I had to accept this, as I want her to mature. I vividly remember being 11-years-old and spending a weekend with my older brother, who was in college. It felt so grown up to fly alone and not have mom and dad around for a few days. Thus, I respect her needing to take this milestone in her own way. I am a shameless hovering parent, and not overseeing her in all activities was a leap for me. But I knew she was safe, and beyond that I had to just let her stretch herself to the next level. As my kid found on her adventure, stepping out of our comfort zone and succeeding brings with it new feelings of accomplishment... all of us "grown-ups" should always be on the look out for ways to expand. I could see the difference as soon as she got off the plane. She had a great time, but beyond that she understood that she can make it on her own....someday! In the mean time, we are glad to have our little bird back in the nest, and she is happy to be home. How about you, what is your mini-adventure and how will it help you grow? 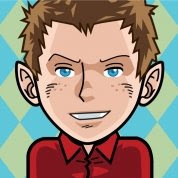 The big trend on Twitter right now is people designing cartoon avatars and posting them in place of their actual photos. An avatar is an animated representation of yourself, and some people have great ones that look just like them or otherwise make you say "wow, that is cool". Thus I gave it a try. I went to a sight called Face Your Manga that was mentioned on Mashable.com. It allows you to try several different face shapes, hair styles, colors, etc... but no matter what I did, my avatar kept looking far too young and hip. I could not make this cartoon character look middle aged and married with two kids -- without making it look stupid. See for yourself. The avatar looks way too young, smart and with it, in a charming boyish kinda way. I am not this cool. This has been a crazy summer. I feel like I blinked and the calendar turned from May to August in one instant. The last few months have been great fun, but it seems that my whole world was put in a blender and someone hit frappe. In a split second the time/space continuum became a smoothie of work, vacation, new book, family stuff, etc..... Then in an instant I felt the blades stop and it seems like things are getting back to the normal hectic pace. My belief is that this is a common experience for many people. Our society is so fast paced and many understand the pressures to get more done with the same amount of time and money. The antidote for the craziness of a wildly spinning life is having connections with other people who understand you at the level of your soul. Friendships are important to keeping us our prospective in check and giving us a touchstone. Personal and professional connections are what makes life real. With over 6.6 Billion people on the planet, it can be easy to get lost. The expression "you can't see the forest for the trees" is fitting. There are so many of us that we don't really notice each other. This is one reason why I think that social media has become so popular. People are longing to connect with each other. Some mistakenly take solace in having a high number of "friends" in Facebook, MySpace, Twitter, LinkedIn. Even when some of these connections are nothing more than a digital link, it makes people feel they are not alone. I am not knocking social media. I find it to be a very useful business and personal networking platform, and I have made several real friendships with those whom I have met through blogging, Twitter, etc.... Yet I wonder when people will begin to desire to thin the ranks of their online contacts and deliver their limited amounts of time to interacting with those who they can have a real two-way dialogue. Following someone in a social media arena is not much different that watching TV. I like to follow the "online celebrities" in the social media communities, but I also know they often do not notice me. Much like the cast of LOST has no idea if I am in the living room seeing their performance, when someone is following over 5000 people, they cannot see me. Sheer numbers of followers become like the Neilsen Ratings. I realize that I am just part of the social media "noise" sometimes. That is okay. But others do hear me, and I listen to them. I enjoy the back and forth discussions that do take place in the online world. I become smarter because of those whom I interact. Walking the line of social media relevance and uselessness is common. Yet creating valuable mutually beneficial relationships with other people is the core of existence. When we can serve others, and have them do the same for us, we make our crowded planet into a village. Each person can discover their own manner to stand out in the stew of humanity. We can get past the crazy schedules and being lost in the crowd. Together we are not alone. What do you think? Leave a comment so I can become smarter because of your unique point of view! Below is a video from StandUp2Cancer.org. They asked bloggers and writers who have been touched by cancer in their lives to submit photos for whom they "stand up for". I appear briefly (at the one minute mark in the video) holding up a sign that says "My Mom: 1926-1984". It has been 24 years since my mother lost her 3 year battle with breast cancer. I was eighteen years old. I still miss her. On September 5th at 8 PM (Eastern) NBC, CBS and ABC will set aside competition and all simeltaneously broadcast, commercial free, a charity fundraiser extravaganza to benefit StandUp2Cancer.org. I like seeing groups come together for a good cause. Kudos to the three broadcast networks for doing this. I will tune in. I once heard Mark Victor Hansen, co-author of Chicken Soup for the Soul, tell an audience to spell out in writing 101 goals that they would like to accomplish in their lifetime. While I was in the audience, and his talk was motivational, I did not scribble down 101 desires. I am however a big believer in having written goals. Each year I spell out a few personal, professional and spiritual (soul goals) to strive for over the coming 12 months. I know that having these in front of me makes it easier for me to make the right choices when facing life. I can look back at all the mistakes I have made, and it is clear that in those moments I was not staying true to my life's goals and missions. Having goals in your line of sight keeps you on track. Like the bumpers they put in the bowling lane gutters for small kids, goals keep you in the middle so you can knock down the pins. Recently I decided to pick up a pen and spell out 101 things I want to do in my life. I have always found it easy in the New Year to write down a few key goals, but discovered that 101 is a very, very large number. It has taken me a few months to get the list over 85, but I am now closing in on the end of my list. Since beginning of writing this list I have already had the opportunity to complete (or set in motion) items which I desire to accomplish. Some of these goals are obvious, others are more far fetched.... but all are attainable in some manner over the next 50 years. Spending the time to uncover some random goals is a great way to help you figure things out and know what you find cool in the world. I think you will be amazed by trying to create a list of 101 things you want to do in life. Maybe you will have an easy go of this task, or like me, maybe you will struggle to make sure that the things you write down are meaningful to you and your family. Yes, one big random goal is I would like to be invited to spend the night in the Lincoln Bedroom of the White House. Now, I do not expect this to happen anytime soon, which means that an unknown future president will need to make the invite.... but I am confident that this COULD happen, so I just need to be on the outlook for the opportunity. And if you are ever elected to the presidency in the United States, remember me! Labels: Figuring Things Out, goal setting. I had the honor to speak at the 2008 SXSW Interactive Conference in May. While I will speak over 40 times this year at a variety of companies, organizations, and conferences..... SXSW was one of the major highlights. Again this year I have suggested a couple educational topics that I hope will be selected for the 2009 SXSW Interactive Conference. Each year this event takes over Austin and brings many of the worlds top technology and social media experts to town to share their knowledge, network, and party into the wee hours of the night. If you are one who has an interest in such things, please vote for my panel suggestions. Click Here. Sign in. Vote (5 Stars is a good number!!!). If you have seen me present somewhere and would like to leave a comment, please do. If you live out of town and will be in Austin for SXSW in 2009.... please contact me when you are in this fine city. Paul Walker was the speaker at the August meeting for the Central Texas Chapter of the Association for Corporate Growth. Paul is the President of Cohn & Wolfe Digital (and Cohn & Wolfe Read-Poland), and is an expert in helping companies understand and better utilize the world of social media. He did a great job in explaining to the audience how to navigate their digital ecosystem and helped many understand the craziness and confusion around this nutty internet thing. Most who read my blog are experts on social media and the world of online networking, blogging, microblogging, search and other aspects of today's digital world. But it is not true that the whole of the business community has embraced these tools. It was interesting to see the blank stare on the faces of many in the audience as Paul opined about how corporate America is changing to meet social media head on. Many business professionals are still puzzling with "what should I be doing in social media?". Meanwhile the research shows that social media is having an influence on buyers. Customers are watching and learning by how the company positions itself in the online world. Successful business leaders are realizing they must also pay attention or be left behind. Additionally, job candidates - especially younger ones - are looking at prospective companies in regards to how committed they are to the whole internet experience: Does the CEO have a blog? Are employees engaged in evangelizing the brand? Is the company living to promote the customer experience? Beyond business, more and more we are finding journalists, politicians, entertainment industries, and public institutions also jumping into the social media deep end. This is not a fad, and those who are staying on the sidelines are missing out while everyone else is playing the game. 1. Set up RSS Readers and Alerts. This is the easiest way to stay on top of what is happening in your industry and with news outlets, thought leaders and your competition. 2. Get active in Social Networks. If you are a business professional and not yet on LinkedIn, get over yourself and sign up. Facebook has a lot of activity, but the main place for business is Linkedin. 3. Pimp Your Crackberry. Your blackberry is more than a phone or place to get email. You can download Google mobile applications (Google Maps is a good tool). The NY Times has an application that will feed the paper strait to your Blackberry (I think YUCK, but some like this). And RSS, Facebook, Twitter and other things can stream straight to your mobile device. This all keeps you better informed and connected everywhere you go. 4. Use Social Bookmarks. Delicious is Paul's favorite bookmarking tool. It allows he and his team to stay tuned into to what each other are finding important in the universe. 5. Share Your Point of View. Yes, blogging is time consuming and intimidating, but over time a good blog is your best credibility tool to set yourself apart from your competition. 6. Track Your Social Graph. While the term "social graph" has mixed meanings out there, his point here is to use FriendFeed (or Plaxo Pulse) and establish one point of contact where you can see the online social media activities of those you follow all in one place. He is right, this makes it easy to stay up to speed without overwhelming yourself with dozens of social media services all at once. Paul offers a "Social Media Bootcamp" for his clients (and others) where he educates them on how to get themselves and their companies up and running to maximize social media. How cool is that for someone who does not know where to start! If you are not familiar with ACG, it is a great organization. If you live in Central Texas, you should check out their local meetings on the second Wednesday of each month. Informative speakers, like Paul Walker, educate and inspire the audience. Additionally, ACG Central Texas is one of the best networking venues for local business professionals. Want Real Political Change? Fire Congress. Toss Them All Out On The Street!!! There is currently a lot of talk in the political world about change. The United States presidential election always brings this wave of desire for change, yet no matter who sits in the White House, we seem to get a whole big scoop of the same. I believe if we really want to see change in Washington DC we as a people need to fire all those in the House of Representatives (maybe the Senate, too!). Both the Republicans and the Democrats have realized that presidential politics is just a game. They pontificate and rant every four years about who is president, but the real party power is in the Congress. Alas, I would like to see us fire all incumbent congressmen and congresswomen regardless of party affiliation. Republican or Democrat, liberal or conservative, man or woman, in Congress for 2 years or 40 years, tall or short, funny or stern. FIRE THEM. If Americans realized that to send a real message for reform to Washington, theWhite House is not the target.... Let Obama or McCain take the chair (it does not matter as much as we think).... But instead lets send a whole crop of new enthusiastic and heart-powered fresh faces into the House. I know that my little blog post will not start a national uprising.... but it is sure fun to imagine the look in the party leaders when they find out that the American people have taken control with their power of the vote and did not just line up to vote along party lines. I know, people will not do this, as many of their local politicians have power that brings tons of pork back to their district. But if we got past that, and put in new people... maybe the new Congress would make things happen. They would certainly be listening closer to the American people than the current Congress. I don't care which party has the majority, just ring out the towel and start over. I know my local congressman. I like him. I voted for him. But we should fire him too. Presentation skills are important in business. When selling a product or service you must be confident and prepared. Weak presentation skills will leave your competition with an advantage. I recently sat through a series of formal sales presentation where three vendors were trying to earn the businesses for a project. As a board member and part of the decision making committee of the group involved, we felt it best to interview several companies to make sure were were making an educated decision. There were three who made the short list to present, all of whom wanted to be hired to complete the project. It was amazing to me how similar, and yet different each positioned themselves... and how they varied in their skill level of delivering a presentation. 1. Do not stand and do a formal presentation (projector, screen, handouts, etc....) to a small group if you are not comfortable as a public speaker. Your nervousness will be magnified in an intimate setting. Make sure you know how to operate your projector and computer. It just looks bad if you need your potential client to help get you PowerPoint to project on the screen. Also, remember to plug in your computer, as if the battery shuts down in the middle of the middle of your pitch, it will disrupt the flow of your presentation. Sometimes with a small group you will be better served sitting around and having a casual conversation. 2. Never explain your costs of doing business to your clients. They do not care about your expenses. The client cares about themselves. They want to know what you will provide for them and the fee they will pay. Educating them on the economics of your business is not why they are in the room. Doing this will work against you when it comes time for them to make a decision. Assume your client knows you have expenses, and stay focused on the value you bring to them. 3. It the prospective client changes direction and jumps ahead and to ask questions, do not dismiss them by telling them that you will have that answer for them later in the presentation. Answer them when they bring up a topic. Even if they are asking for price. I realize that a sales professional does not want to talk about price before they have established value, but if the client wants an immediate price discussion, you have most likely lost control of your presentation anyway. Give them what they want. If you will not work with them in the presentation, they will assume you will be difficult all along. Clients are the boss. Not you.... even during a sales presentation. Show them your flexibility up front. 4. Sales training courses teach us to compliment the prospect. It is common when a question is asked to hear well trained professionals respond with "That is an excellent question" or "I am really glad you asked that". This is good advice, as it can show the other person that you think they are smart. However, do NOT do this every time they inquire about something. It will suddenly become patronizing and canned if you overuse this technique. Because this is taught so often to people in EVERY industry, this technique is also recognized by the client as a "trick"...so do over use giving compliments. 5. Dress professionally when you are trying to earn someones business. In today's casual society we forget the old rules of making a good impression and "Dress for Success". You need to know in advance what you clients will be wearing and what is appropriate for their industry. Select clothing that is just a little nicer than what you expect them to be wearing. Too fancy and you will look and feel out of place, but too casual will remove your look of professionalism. 6. Keep it short and do not run over you allotted time. If your prospect is talking with several of your competitors, they will start to understand the basics of you industry very quickly. Spending too much time in education will bore them quickly. It will also shorten the time you have to make you case. Running over the agreed upon time frame will make you look like an amateur. Respect their schedule even if you have to leave out part of your presentation. Not showing every prepared slide is not a crime. 7. Have something unique and useful to offer the client. Regardless of if you win the business or not, leave the prospect with a fresh idea about how they can best accomplish their task. Show them that you are willing to think out of the box and that you have their best interest at heart, no matter who is awarded the contract. All things being equal, most people would want to select the vendor that has shown creativity. If you hold back your creative ideas, you may never get the business. Share freely and you will make a better impression. If you are nervous about making presentations, remember that speaking is a learned skill. It takes practice. Do not let your fear stop you from getting more experience. If you lose a deal, find out what the competition did to be selected and learn for next time. Develop your presentation skills and you will find more success. Tonight Some Assembly Required: A Networking Guide for Women hit #3 on the Amazon.com Best-Seller list in the category of "Women & Business: Management & Leadership"
Thank you to all who have been purchasing the book and telling your friends. My brothers and I are sorting through some old family "stuff". My dad has moved to a smaller place, leaving behind a lot of things that need to be divided up or sold. While this has it tough moments, on another level -- sorting through my parents life has been very therapeutic. The hardest thing to realize is that after a lifetime, much of the possessions that we acquire are just things. Their monetary value pales to the sentimental value, and in all cases it is just stuff. I look at my own life. I am not even half the age of my father, and I imagine that someone going through my personal belongings would roll their eyes and say "Huh??? Why did he save this?" I had imagined that I would want to take a lot of things back with me to Texas. I am the only kid in my family raised in the house my father lived in for the past thirty years, and my bedroom remains much as it did when I left for college 24 years ago. Dad was widowed only a few years after we moved into this house, and little has been added since my mother passed away. Sure, some replacement furniture and other items...but most of the that we sorted had also belonged to mom. I had thought I might have a stronger attachment to trinkets and little knickknacks. While there were some major items that we each wanted to take for ourselves (fortunately there were no arguments), it turns out that most things are just things. I realized that if I took stuff home, much of it sit in boxes until my own children had to one day sort through them. Better to take only a couple of items that will have strong emotional meaning in my heart. A co-worker told me that a few years ago her father gave her a holiday gift that consisted of a photo of him standing in the empty attic after he had purged his house of boxes of stuff. The caption read "You are welcome". He had made sure that one day when he passed there would not be too much to sort out. Fortunately, my parents were not pack rats, so there was not much to do, and my siblings and I have the time over the long weekend to enjoy each others company. But I had an "ah ha" moment with all of this. Collecting all that we acquire day to day is nice, but we must keep it in perspective. The things around us are important to us, not necessarily anyone else. One day my stuff will be sold on ebay. And this is not a bad thing. It is a reminder to me to cherish and enjoy all that I have in the moment. Believing that stuff has a deeper meaning is misguided. What I hold dear in my heart is not a Waterford Crystal goblet or my dad's bowling trophy, but rather it is the memories of the joy and love that these two people exposed me to from the first days of my life. I sit here writing this with tears in my eyes because I know in my soul how fortunate I have been to be part of this family. I look at my older brothers (yes, much older!) and appreciate them. No trinket is worth more. How do current economic conditions affect your recruiting efforts here in Austin? Austin may not be as heavily impacted by the slowing economy as much as other markets, but the current national economic situation most certainly impacts our local recruiting efforts. Candidates are cognizant to the fact that oil is $140 a barrel, gas is $4.00 a gallon, housing markets are down while foreclosures are high, airlines and automobile makers are on the verge of bankruptcy, and the U.S. dollar is relatively weak. Savvy candidates are aware that the national unemployment rate is at a four year high. These topics consume the news media. Here in Austin we read and hear this news daily. We all feel the brunt of this news every time we take a drive or go to the store. Though these types of headlines are typically coupled with corporate downsizing, layoffs and hiring freezes, startup companies in Austin, TX are still developing new products and services and are still pursuing and landing funding. Many local startups are hitting the accelerator and are seeking to grow. In Austin the demand for Engineers, Sales/Marketing folks and top talent in general remains high. And, if you’ve ever tried to recruit and hire these folks in Austin you know it’s no small feat. They are in high demand! Though Austin may seem somewhat unaffected or less impacted by the stormy economy, the psyche of Austin based employees and candidates are certainly altered by the news of a slowing national economy. The thoughts and actions of these candidates matter! In a flourishing market people tend to have great confidence in their abilities and choose to seek new opportunities in hopes of furthering their career. When times become strained, people grow instinctively cautious and tend to hunker down. In these uncertain times, the quality of active candidates that respond to job postings decline and good passive talent often goes into an extremely passive mode. Basically, candidates keep their heads down and become stationary. It’s natural and less risky for them. People grow hesitant to change jobs because they fear little opportunity will be available if the new job doesn’t pan out. As a result, it takes a greater recruiting effort to get candidates to consider and accept new positions. Most corporate recruiting strategies are relatively inert. However, keeping the same strategy during an economic slowdown that you’ve deployed during an economic uptick can have a disparaging effect. Now is not the time to lessen or slow your recruiting efforts. You’ll actually have to spend more time recruiting coveted talent. Today they’re harder to find, court and land. Candidates make “career moves” not “job changes”. It’s unlikely a candidate will accept your offer unless you can convince them there is more upside. Focus on the value proposition of the new opportunity such as their ability to make a greater impact and growth. Focus on improving your Employment Brand. All good things take time and effort. Your employment brand is no different. Now is a good time to apply heat, light and focus to your branding efforts. Brand or be branded! Source from companies and industries that are faring worse than yours. This alleviates their risk factor of making a move and changing jobs. Top grade your recruiting staff. Companies that downsize or have req. freezes often reduce their recruiting department. Pursue and hire all-star recruiters to replace mediocre ones. I hired some of our best recruiters shortly after the dot com bust. Austin in general or your company specifically may not be overly affected by the economic slowdown, but activity levels of prospects and candidates are. It seems to always be a “candidates’ market” in Austin, TX. Happy hunting!